UNC’s systemic fraud was a “typo.” Shameless! The academic fraud at UNC was intergenerational: it went on long enough that a participant in the early days of the fraud could see his child grow up, come to this university, and also participate in the fraud. For latecomers, a quick summary of the fraud: UNC had institutionalized “paper courses” running out of the African Studies department. All a student needed to do was submit a paper, any paper (not even written by the student), and the student would get a passing grade, with “A” being pretty common. There are several reasons the “fake classes” went on so long. Primary was because Admin has complete power: every whistleblower found himself out of a job and career ruined (a specific shout out to Mary Willingham, who received a 6 figure settlement for being punished for whistleblowing). Since it was an academic fraud, their accreditor, SACS, should have found it in their many “accreditation reviews” over the intergenerational fraud, but the same admin who run UNC also have a guiding hand in SACS: SACS policies make it impossible to detect even the most egregious fraud, even when the whistleblower provides documentation, and SACs allows the universities to perform all self-reviews, self-affirming their own legitimacy. Because the fraud was so blatant, so widely known, there were investigations, but admin squelched them regularly. Eventually there was so much evidence that it was no longer possible to cover up the fraud going on there, and, finally, UNC admitted to fraud. The accreditor stepped in, and levied the biggest penalty it could: pay raises were granted to administrators, for their failure to cover up the fraud. Yes, that’s the penalty. I’m putting some spin on that interpretation but bottom line, UNC didn’t have to pay a price for their academic fraud. The admin there just had to submit some paperwork showing that they investigated themselves, and were satisfied they weren’t committing fraud anymore. SACS accepted UNC’s self-investigation, as always, and then admin gave themselves pay raises and bonuses for doing the paperwork covering up the fraud…these guys just can’t lose. So, no penalty for the academic fraud which UNC admitted to, and lost court cases to whistleblowers trying to stop it. What of the NCAA? Our college athletes are supposed to be students as well, supposed to be getting a college education in exchange for sacrificing themselves at sportsball. The NCAA exists to protect those students and see to it they’re getting a fair shake (stop laughing!). It’s also supposed to make sure everything is fair (stop laughing! ), and if one school is putting the athletes in fake classes, that’s not fair to the other schools, who are assuredly working hard to make sure their student athletes are getting a legitimate education (stop laughing!). I concede it’s hard to do this with a straight face but I’m trying to take the NCAA at their word, here (stop laughing!). The university aggressively fought the NCAA’s efforts to assert its authority in this case, spending roughly $18 million on legal and other fees. I really want the gentle reader to put things in perspective here. UNC is a state school. Your tax dollars went to support an intergenerational fraud, a fraud which no administrator lost her job over….not even one, although quite a few got pay raises and bonuses for covering it up. Your tax dollars also went to defend this school from the consequences of that fraud, to the tune of $18 million, raising tuition all the while. Classes at this school have hundreds of students in them, and are taught by sub-minimum wage adjuncts, because the taxpayers just aren’t contributing enough money to pay a decent wages to the teachers. But after a three-and-half-year investigation, and despite the institution even agreeing that it had engaged in academic fraud, the NCAA said it couldn’t definitively conclude that the “paper courses” in the department of African and Afro-American studies had been designed and offered as an effort to benefit athletes alone. Thus, according to the NCAA’s Committee on Infractions, which adjudicates allegations of wrongdoing, they did not violate the group’s rules. Wow, a written confession and hundreds of pages of evidence still isn’t enough to “definitively conclude” anything here. It’s demented how admin’s failure to cover up the fraud actually helped them. See, these paper classes, when they started up nigh 20 years ago, were intended just for athletes; it was supposed to be hush-hush, just a single student in each class, all “taught” by a compliant professor who’d keep her mouth shut. That was the plan, and with a single-student-per-class setup, it should have worked. But the fraud went on for so long that word got out; thousands of students, about half of them not athletes, were now partaking in the fraud. And because of admin’s failure to keep the fraudulent system private, it was ruled the system was not “an effort to benefit athletes alone,” and so the NCAA sees no need to intervene. “The panel is troubled by UNC’s shifting positions … depending on the audience,” the report states. Yeah, those shifting positions are pretty shameless. SACS looks the other way on this fraud because they decided it was mostly about athletes (that’s what UNC told them, after all) and so not SACS’ concern. The NCAA looks the other way on this fraud because they decided it was mostly about students (that’s what UNC told them, after all), and so it’s not the NCAA’s concern. The fact that the fraud was widespread saved UNC. I can’t make this stuff up. But it’s fraud, right, UNC even admitted to it, finally, right? Not so fast. 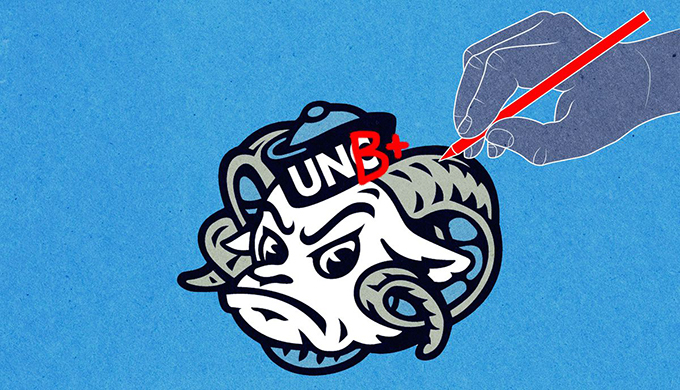 Turns out UNC’s written admission of fraud was a typo. Whoa. UNC is claiming that their lawyers accidentally typed out a confession to “academic fraud” in their confession of academic fraud, in response to a 100+ page report exhaustively detailing the academic fraud. That is one gold-plated HECK of a typo. You want to bet no lawyer will be fired over this “typo”? And the NCAA bought this ridiculous story? This is a major point. Both accreditor and the NCAA have said this level of fraud is perfectly acceptable, and accepted UNC’s contradictory claims that the fraud was simultaneously exclusively for athletes and not exclusively for athletes. The gentle reader had better believe that administrators at other universities are taking notes, and realizing that even a slight patina of integrity at their schools is completely unnecessary. It is like a dirty cop not even stepping out of the street to accept his payoff or a bank robber not even bothering to put on a mask before entering the bank. The corruption is right out in the open and they don’t punish it. Another important detail to highlight: this corruption was wide open. Thousands of students partook. Many faculty knew about it, but were helpless to stop it. Every administrator had to know, despite their denials; there’s a nice racketeering case here if the Feds ever decide to pursue it. Granted, if they did so, UNC would be spending infinite taxpayer dollars to defend themselves from the infinite taxpayer dollars the government could spend to prosecute them, so I reckon I can see why this open racketeering is tolerated. Of course, the UNC would be getting a big chunk of its money for lawyers from the student loan scam…maybe we could get rid of that, and then we’ll see an iota of justice here?